I used to think of Billy Wilder primarily as a very witty, literate screenwriter who made sophisticated, Lubitsch-like films. But re-watching Sunset Boulevard and Stalag 17 recently, I was reminded again of how hard-edged Wilder’s sense of humour is. Of course, there was never any denying that he made some very cynical movies (most notably Ace in the Hole, which anticipates the evils of today’s media in its story of a reporter exploiting the situation of a man trapped in a cave). But because Wilder is such a clever writer who constantly comes up with lines that make you smile, and because his dialogues are so layered and fast-paced, requiring full concentration, you can sometimes lose sight of how dark some of his material is. Take Stalag 17, a film about American prisoners of war in a German camp (or stalag) a few months before the end of the Second World War. 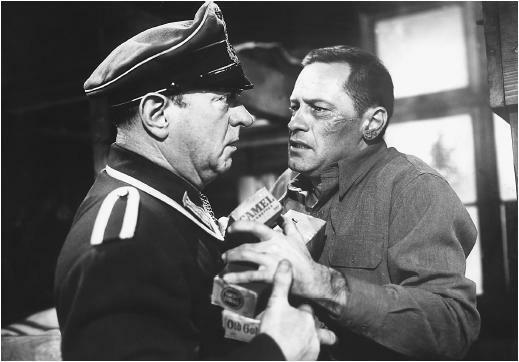 The main plot involves their realisation that there’s a stoolie in their midst who smuggles information to the camp commandant; the finger of suspicion points at the unsocial Sergeant Sefton (played by William Holden) who spends much of his time trading with the Germans for special privileges (a few dozen cigarettes in exchange for a precious egg, for example). The effect of this film is different from that of the obviously absurdist anti-war comedies – movies like Altman’s M*A*S*H* and Kubrick’s Dr Strangelove. The deliberate, over-the-top lunacy of those movies paradoxically makes it easier for us to see how serious-intentioned they are. Army surgeons cracking jokes while digging about in the bleeding innards of their doomed patients? Mushroom clouds spreading gracefully across the earth’s surface while a gentle Vera Lynn song plays in the background? How can this not be ironical? But Stalag 17 is harder to figure out, because its tone is more realist and because, in a couple of scenes, it steers close to making POW life seem like one long buddy picnic. There are Christmas trees, there is much hurrahing to “When Johnny Comes Marching Home Again”, there’s a bit of fooling about with a genial prison guard, a bit of volleyball, and some ogling of the Russian women prisoners across the barbed wire. 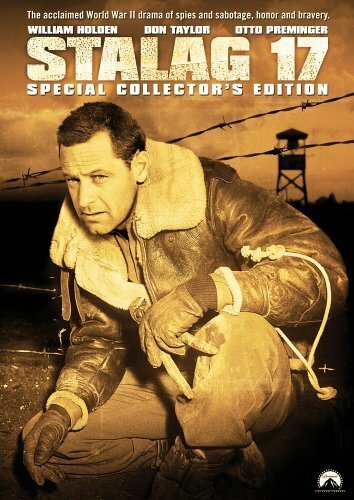 But despite its few instances of soft-pedalling, Stalag 17 is a very thoughtful movie. It never really allows us to forget its opening moments, when two prisoners are coolly shot dead by German guards while trying to escape, their bodies left to lie in the slush the next day while the camp commandant smilingly explains that “fortunately your companions did not get very far – they had the good sense to rejoin us”. And there are, in fact, a couple of scenes that seem to point the way forward to M*A*S*H*, which was made 20 years later in a more permissive Hollywood. In one scene, after the prisoners are given copies of Mein Kampf to read, they stick Hitler moustaches on themselves and make faux-speeches in a pidgin language that combines random German words (or German-sounding words) with American slang. “Everything is Gesundheit, Kaputt and Verboten! Is all you indoctrinated? Is all you good little Adolfs?” (Hawkeye Pierce and Trapper John would have been proud.) In another scene, one of the men receives a thinly disguised Dear John letter from his wife, informing him that she found a baby on her doorstep, that it has her eyes and nose, and that he must believe her. It’s an impressive anti-war speech, but in the context of the story it also indicates a selfishness in Sefton’s personality. Subsequent events allow him personal growth. When he finds out the identity of the real stoolie, he’s in a position to milk the knowledge for personal gain, but he makes another choice instead. And it’s typical of Wilder’s style that this is depicted as unsentimentally as possible, without turning Sefton into the Hollywood Hero who saves the day. P.S. More on Wilder’s wry treatment of death. 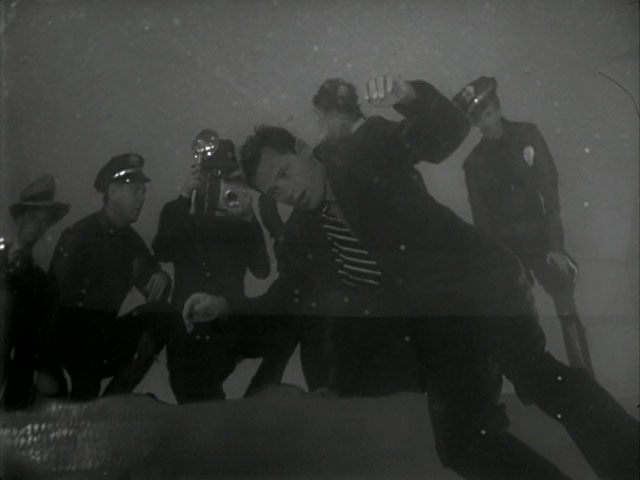 My Sunset Boulevard DVD has audio commentary by Ed Sikov, who wrote a book about Wilder, and from it I learnt that the original opening of the film was a scene set in a morgue, where the corpse of Joe Gillis (the movie’s leading man, also played by William Holden) engages in conversation with other dead bodies. But during a preview screening, audiences laughed so hard at this scene that Wilder had to come up with something different: hence the macabre yet beautiful shot taken from the bottom of the swimming pool in which Gillis’s body floats as policemen try to fish it out and newsmen take photographs. Stalag 17 is a pretty influential movie in some ways. It defined Holden's persona as the sharp-tongued outsider hero which he used pretty well in David Lean's The Bridge on the River Kwai a few years later. Also, it may have been an influence on John Sturges' The Great Escape, which has a similar plot but is nevertheless a lot more serious in its tone and lacks the wit of the Wilder film. Interesting point about the quasi-satires of Wilder (and even Lubitsch) being grossly underrated. Dr Strangelove is no doubt a wonderful movie. But I'm sure Kubrick must've been influenced by cold war satires like Wilder's One, Two, Three or even Lubitsch's Ninotchka which predates not just other cold-war satires but the cold war itself!! By the way, I just read that Montgomery Clift was Wilder's first choice for the lead role in Sunset Boulevard. The film would've been so very different had Clift bagged the role. I guess the voice-over narration would've been far less effective. The movie might have turned out to be a rather heavy romantic melodrama along the lines of Stevens' A Place in the Sun. Also, Bill Holden's brilliant run in the fifties would've been aborted at the start! shrikanth: and apparently Wilder's first choice for Sefton in Stalag 17 was Charlton Heston. If that had happened, who knows, we may have been spared the Biblical spectacles of the late 1950s! Jai, I'm not sure why this is particularly distasteful. There were all sorts of men in the German army, some decent and some not. Just like there were cold-blooded murderers of surrendered German prisoners-of-war among the Allies. To constantly tom-tom the idea that one side was all good and the other absolutely evil surely is an oversimplification? I think Wilder recognised this, and hence his nuanced approach. Feanor: I think I'll find a way of rephrasing that bit before it becomes controversial. Not arguing in favour of good/evil simplification at all, just implying that our associations of Nazism and German WWII camps are so terrible that it can become discomfiting for a viewer to see nuanced or positive portrayals of German prison guards. 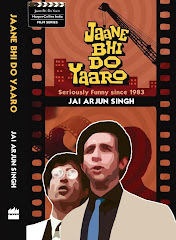 And this is a fault of the viewer's perceptions, not the film itself. But it still does affect one's response to the film. The type of film (and what it's focusing on) does matter too. For example, I know The Reader is a flawed film in some ways, but I didn't agree with the criticism it got for making viewers feel sympathetic towards a former Nazi guard. I didn't think the film was "excusing" Hanna Schmitz's past actions, much less using her as a pretext to whitewash all Nazi crimes. But it didn't shy away from reminding us that almost anyone, in a particular situation and at a particular time in history, is capable of doing morally reprehensible things. Stalag 17, on the other hand, is a different sort of film, and I felt mildly uncomfortable about the bits where it shows the POWs having a good time, fooling about with the guard etc. A long but interesting piece by Cameron Crowe on the making of Jerry Maguire. He speaks at length about how he tried to court Wilder for a cameo, and how 'The Apartment' (my favourite Wilder also) was an inspiration for his film. a fan apart: thanks for the link. Hell, I have trouble imagining Tom Cruise and Wilder in the same room. There's a gap of nearly half of movie history between them. P.S. shrikanth, I see what you mean about Sunset Boulevard being a very different film with Montgomery Clift as Gillis, but in a way it might have made for an even more fascinating contrast between acting styles - Clift doing the Method vs Swanson and von Stroheim, the old-timers of the silent era - which was part of the point of the film. And to carry that idea even further: can you picture Brando as Gillis, playing against Swanson? Holden was an understated actor, but he wasn't as representative of the "New Acting" of the 1950s as Brando and Clift were. jai: Given that Clift always had an air of vulnerability around him, the Swanson-Clift chemistry might have been more akin to a mother-son relationship as opposed to a romantic one. Brando might have done quite well in Sunset Boulevard. The Gillis character's relationship with Norma Desmond is not too dissimilar to the Stanley Kowalski-Blanche Dubois chemistry. However, Brando's casting might have entailed a different director. I can't imagine Brando - The Great Mumbler uttering those wonderfully literate lines penned by Wilder. Talking about the 50s and the "New Acting" of the era capturing the public mood, it is very surprising and rather ironical that the most commercially successful stars of that decade weren't the young turks from the actors' studio, but actually Jimmy Stewart and William Holden who debuted back in the thirties! Saw "One two three.." recently. Wilders writing is very taut and witty.It makes me smile. But I like Preston Sturges more. Am I thinking of another movie? I seem to remember an 'original' opening scene to the movie where either wm holden or his flunkie from the pow camp run are in modern office building, and run into the lt. holden escaped with... they didn't see or acknowledge each other, but the narration took it from there and to the pow camp..
sound familiar to anyone ? @ shrikanth: I do not agree that Sunset Blvd. would've been different had Clift played Joe. The simple reason being Wilder came from Lubitsch school. Lubitsch was a perfectionist who insisted on polishing a screenplay until it was as good as possible. "Preparation is everything," he said; it was vital that every scene in the script "be detailed down to the last raising of an eye-lid." He never allowed actors to improvise on the set — an attitude that Wilder picked up from his mentor when he became a director. So you see it never would've mattered who played Joe Gillis. Clift would've played the role as per Wilder's vision. Therefore, Blvd. turning out to be "a rather heavy romantic melodrama" is too much imaginative concession on your part and would've been possible only in an alternate universe where Wilder was an actor's director. So you see it never would've mattered who played Joe Gillis. Clift would've played the role as per Wilder's vision. "William Holden as Joe Gillis [is] a great performance, in that Joe's self-pity is held at arm's length from the appeal of the actor. Holden is brave enough to show Joe's malaise for what it is. First casting was Montgomery Clift, who dropped out ... This was good fortune for Billy Wilder, for Clift would have made Gillis insidiously charming instead of a desperate scrambler. You would have wanted to save Clift (that was his trick); Holden knows that Gillis is beyond salvation." I do agree with you Jabberwock that actors like Clift are not blank slates. "...it never would've mattered who played Joe Gillis" was just a momentary response to Blvd. turning out to be "a rather heavy romantic melodrama." Normally I refrain from such sweeping statements. I'm sure you'd understand.